Cover art for the program book for the Radcon 2006 sci-fi convention, where I was Artist Guest of Honor. The theme of the convention was "alternative history" (what didn't happen), and Writer Guest of Honor, my pal, Jay Lake and I were discussing what creative thing we might do for this. 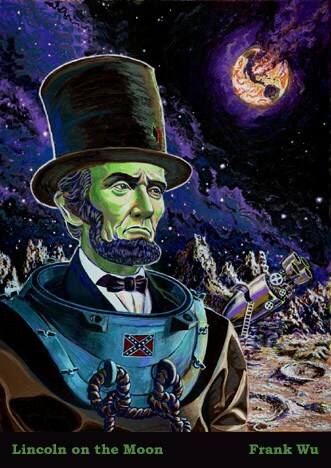 I said, what if we do Abraham Lincoln on the Moon? And Jay said, OK, but only if Lincoln's a zombie and the South won the Civil War. Thus we have the illustration we see here. Jay wrote a story for this - called "The Last Familiar Thing" - which is available if you can get your hands on a copy of the Radcon program book, or if you pony up the bucks for the Greetings from Lake Wu (stories by Jay, art by me) special edition. Also, you'll notice that in the image above, Lincoln doesn't have his signature stovetop hat. It was a last minute addition after I re-read the story and realized I'd forgot to put it in - which was important, since the hat is the titular "Last Familiar Thing." 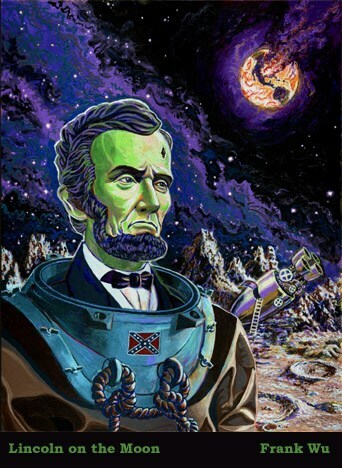 Zombie Lincoln on the Moon!